A collective of Dover-based artists and their guests are opening up their studio building to the public again, presenting both complete and in-progress print-based work across their active workspaces. 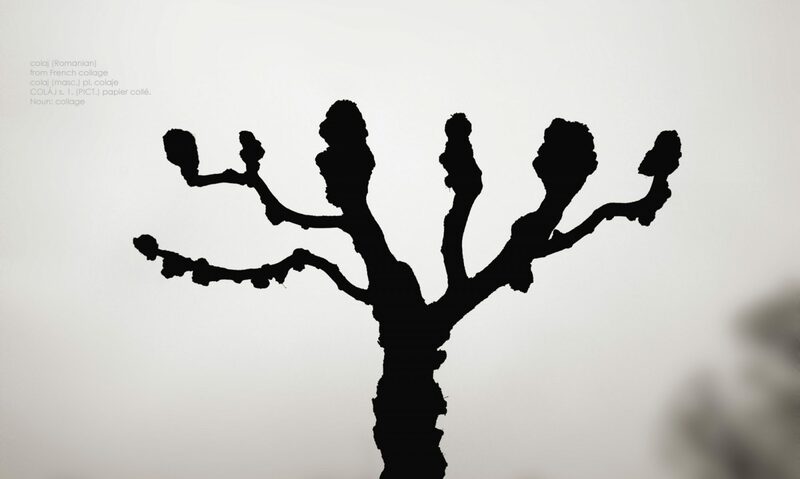 The event, part of the sixth Fête de l’estampe festival, will bring together contemporary print and artists’ books and aims to present an expansive view / idea of what print can be. All are welcome to visit this free studio event and no pre-booking is required. Une collection d’artistes basés à Douvres et leurs invités ouvrent les portes de leurs ateliers au public. Ils présenteront des œuvres imprimées – complètes ou en cours – dans le cadre de leurs espaces de travail individuels ainsi que dans une exposition collective dans leur espace d’exposition. L’événement réunira l’impression contemporaine et des livres d’artistes avec l’intention de présenter une vision / idée expansive des possibilités de l’impression. Tous sont invités à visiter cet événement gratuit, et la réservation n’est pas nécessaire. Devenue au fil des années un succès, c’est un rendez-vous annuel à ne pas manquer. La Fête de l’estampe permet à un large public de découvrir dans une ambiance chaleureuse la richesse de ce moyen d’expression qui comprend la gravure, la lithographie, la sérigraphie ou encore les procédés numériques. Des expositions, des performances, des visites d’ateliers, stages, démonstrations, portes ouvertes, cours, conférences, ventes aux enchères, kakémonos géants, etc. sont organisés dans toute la France et même au-delà, en Europe, le jour de la Fête de l’estampe, autour du 26 mai 2018. La Fête de l’estampe 2018 reçoit le soutien du ministère de la Culture et de la Communication. Over the years, the success of this festival has made it an unmissable event in the cultural calendar. 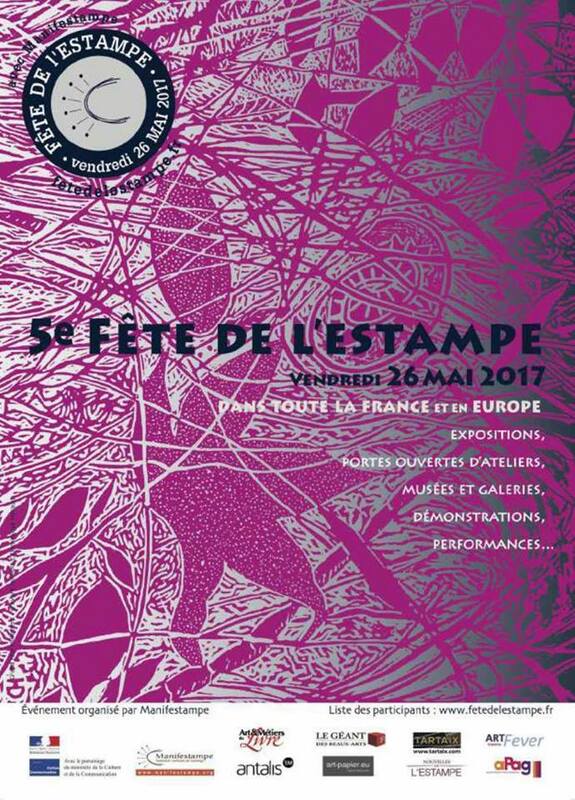 With the support of the French ministry of Culture, La Fête de l’estampe provides a festive opportunity for many to discover this rich art that includes lithography, engraving, serigraphy, artists’ books and even digital prints. 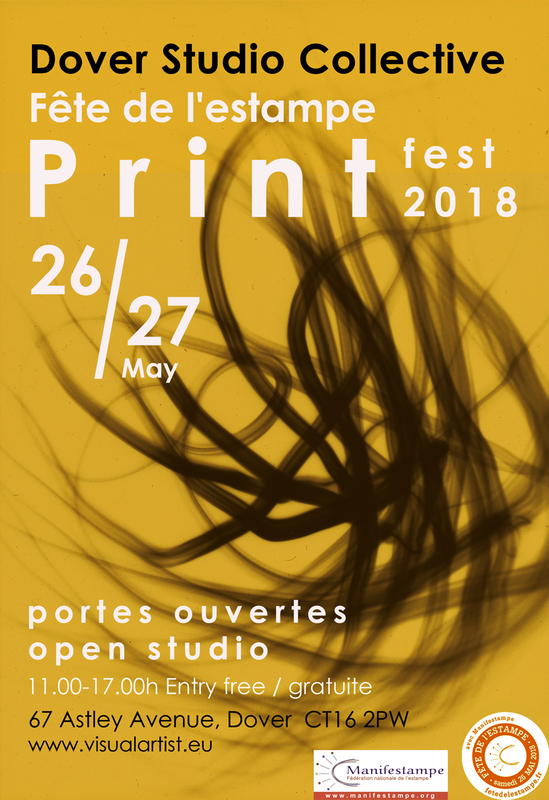 Exhibitions, outdoor studios, training sessions, open studios, conferences, performances, auctions, and giant prints are organised in France and in many other countries in Europe on 26th May, 2018, for one day, or longer in some areas. Although parking is limited on site, there is plenty of parking space available within 50 meters, just beyond the railway bridge. There is a bus stop near the end of Astley Avenue (routes 15/89/90/61), and the studio can be reached on foot 1-2km or taxi from either Dover railway station or ferry terminal. Entry is free / gratuite. Le stationnement sur place est limité mais il y a moyen de se garer à moins de 50 mètres dans un parking a l’arrière du pont ferroviare. Un arret de bus se trouve en bas de Astley Avenue (routes 15/61/89/90). L’atelier peut être atteint à pied ou en taxi depuis la gare de Douvres ou le terminal de ferry qui se trouvent à 1 ou 2 km. Spel för åtta / game for 8 is an 8 page mini A7 format book designed for the forthcoming Ritual Biennial in Philadelphia USA, comprising a single sheet collaged and folded into book format, inspired by my old vinyl recordings of music by Karl-Birger Blomdahl. La Montagne is a multi-page concertina collaged A6 book considering/exploring mountain ideas, shapes and forms, including ‘onze gouden berg’ & ‘J’ai vu’. 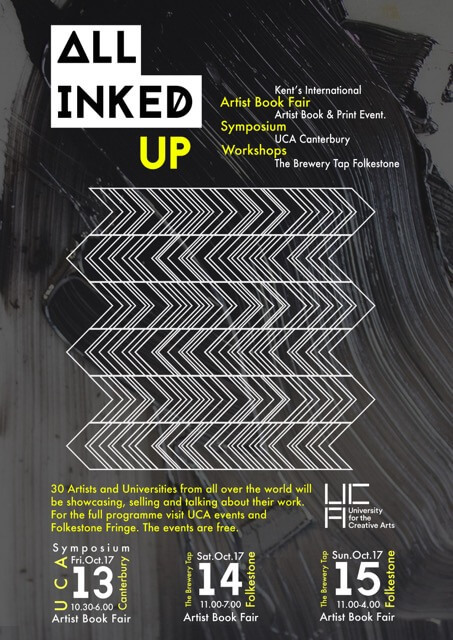 All Inked Up is an International Artist Book and Print Event spread over two venues, UCA, Canterbury and The Brewery Tap, Folkestone, comprising of an Artist Book and Print Fair, Symposium, Workshops and a final Exhibition of four internationally acclaimed artists at The Herbert Read Gallery UCA, Canterbury. The event will build the audiences awareness of the Artist book as a primary medium and method in artistic practice to introducing the broad possibilities that the book format covers, from Illustrative narrative to sculptural forms through to digital, audio/video and performance work. The Event will feature over 30 Internationally recognised Book Arts from Spain, South Korea, Japan, Holland, Germany, Portugal, Ireland as well as the U.K; the work of Staff and Students from European Universities, Spain, Norway, Ireland, Scotland and England as well as local Artistic community in the South East, Resort Studio, Open School East, Intra, DBA Print studios and Folkestone’s Creative Quarter. You will have the opportunity to talk directly to the Artists about their work, ideas and how and why they use their methods of production. Sun’s out – cyanotype time! The sun was shining brightly at last, providing an opportunity to experiment exposing a few more cyanotypes. Cutting out paper and card to make stencils was one of today’s explorations. These were then laid on top of the sensitised cotton fabric. An old modified contact printing frame, originally made for 35mm negatives to produce a 10×8 inch photographic contact print, is perfect for keeping the stencil in place, with enough pressure when closed, to stop light leaking underneath a heat-warped stencil in the noon-day sun. 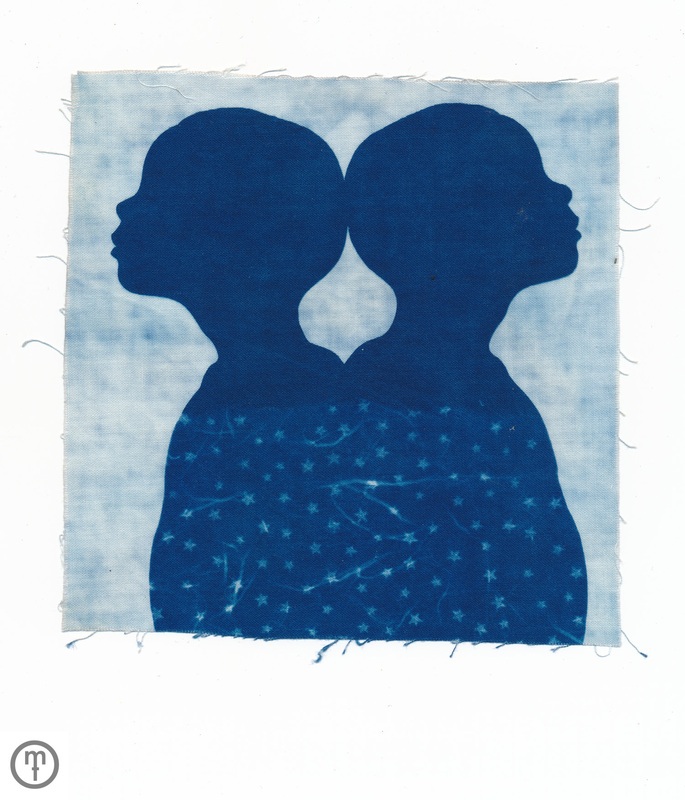 The exposure (at around midday) was 20 minutes, which produced a rich indigo blue in the exposed areas of fabric, and still registered the star printed mulberry paper ‘clothing’. The orange fabric, with a similar exposure, produced a really deep indigo colour, but the mulberry paper detail was a little over exposed, (although I still like the effect). It is a little hit-and-miss judging exposures, due to the different intensity of the sun as it arcs from morning to afternoon, and the variable of fabric cyanotype coatings from different batches, but is still really exciting when the densities ‘work’ and all parts of the stencil are visible. Fête de l’estampe 2017, à vous de jouer ! PRINT EXCHANGE EXHIBITION IN NYC! All of the prints submitted for The Print Exchange 2014 (including my own mini print edition) are now viewable online. Check out all of this year’s Print Exchange prints HERE. 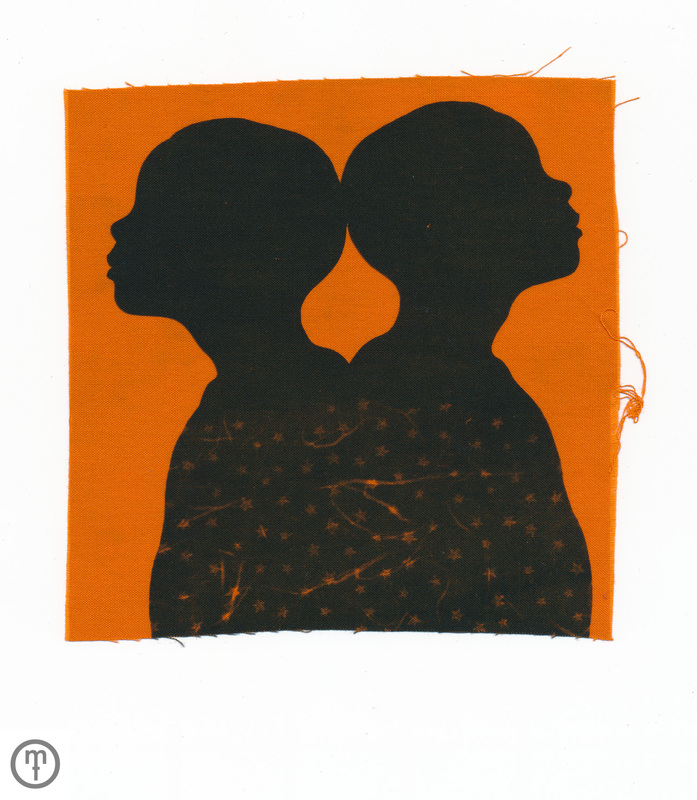 The Sketchbook Project will be exhibiting almost 400 prints that were submitted to this year’s global print exchange! Please join us at 7 Dunham Gallery in Williamsburg, Brooklyn for the exhibition, which will be on view from July 31th – August 7th, 2014. Come join us for a fun event, drinks, and hundreds of amazing works of art! Gallery hours will be 12-5 on the weekend, and by appointment if you want to see the show from Monday 8/4 – Thursday 8/7 by giving a call to the gallery at 631 682-2250. Check out the event details here: RSVP and invite friends to the events. These images were shot with a classic Polaroid OneStep camera first introduced in 1977. The film stock is an original Polaroid manufactured SX70 pack. Easy to use and totally reliable, this was a super little camera to explore instant image-making with. My images often develop out of quick sketches, inspired by many things such as a dream, a feeling, something suddenly remembered, a song, or a particular experience. With a palette of diverse figurative elements, I explore emotional responses to life, colour, pattern and language. My work creates a juxtaposition of dreams, realities and sensations, fleeting moments from life inspired by my own experiences. I explore a sense of empathy for existing across different places and times, examining personal sensations of deja-vu, while moving through times, locations, and states of being, without a fixed linear chronology. My artwork has been commissioned and represented in various publications, with solo and group exhibitions showing in the UK, France, Holland, Spain, Germany, Italy, Canada and the USA.